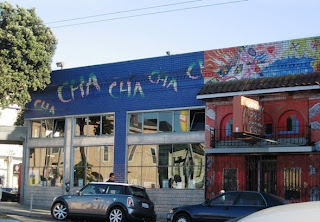 So we went to Cha Cha Cha's on Haight, hippie zone. Wow. I will return here. The food was so good. You simply order several different carribean-based dishes and pass them around, family-style, putting a dab of this or a dab of that on your plate and snarfing it down. Some guys, of which Tom is a customer, took us & another couple here for dinner and invigorating conversation. 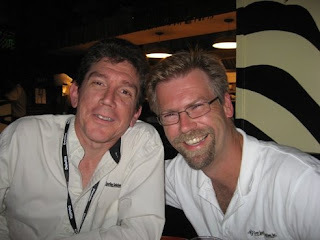 Meet the two gentlemen who took us to dinner: Chris Heller and Larry Grey. Click here for their website. We had a fantastic time. I was encouraged to find two families at our table were homeschooling and had stay at home moms at the helm. They also were church goers. The media would have us believe all of this is out-dated, but I am here to say the traditional family is alive and well. After dinner, enroute to our motel, Larry drove us at the speed of light down Lombard Street. Understand this is the crookedest street in America. If you're unfamiliar with it, click here. 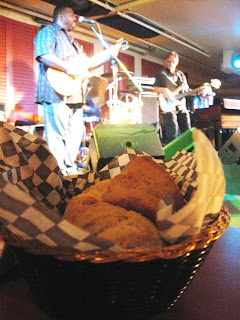 Another night, at Lou's Blues, waterfront, we heard Brad Wilson. I really enjoyed his music and he was great with the crowd, too, very, very personable. 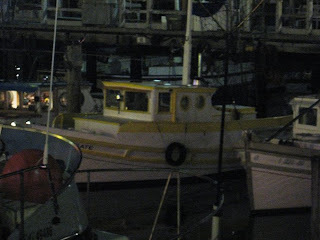 Always leave time in the evening for a stroll along the waterfront. I've never felt threatened or endangered in San Francisco, not sure why. Be smart and you'll have a great time.